The General Assembly's Legislative Intern Program offers approximately 100 of Maryland's college and university students the opportunity to provide research and staff assistance to legislators during each session and to have both an educational and practical work experience in the Legislative Branch of State government. Upon acceptance into the program, students interview for placement with legislators, committees, or caucuses of the Maryland General Assembly. 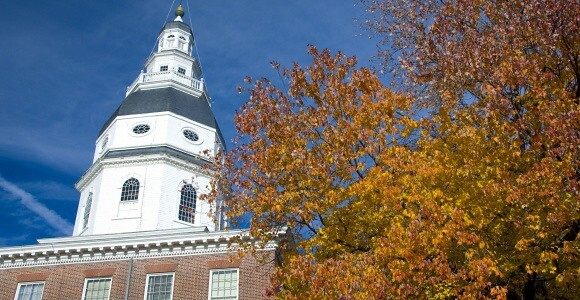 · Be able to work in Annapolis at least two days each week during the 13-week legislative session. Many of the interns are political science majors; however, students working toward degrees in other areas who are interested in learning firsthand about the process of State government are encouraged to apply. Academic credits granted to interns by their colleges and universities range from three to 16, depending on the number of days per week the interns work in Annapolis and on the amount of additional academic work that is required by the sponsoring professors. Each intern is awarded a stipend to help defray the costs of participating in the program. The total session stipend varies, depending on the number of days per week the intern works in Annapolis. To be eligible for the program, a student must be able to work a minimum of two full days each week of session. The General Assembly meets annually for a period of 90 calendar days, beginning the second Wednesday in January and continuing through early April. During the initial months, the busiest days are Tuesdays, Wednesdays, and Thursdays, with few or no committee hearings scheduled for Mondays or Fridays. Most legislators would like their interns to work the three days from Tuesday through Thursday or full-time. However, realizing the demands of college scheduling, the General Assembly accepts students who are able to work only two days per week. Since the legislature does not take any holidays during its 90-day session, interns are required to commit themselves to a weekly work schedule and to take no holidays or spring break.